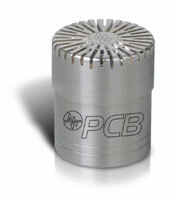 PCB Piezotronics, Inc.: A new free-field microphone, model 377A06 from PCB Piezotronics, Inc. provides an accurate (flat) response in applications where high frequencies (up to 40 kHz) need to be measured very accurately. The 377A06 avoids an overload that can be experienced when a standard high sensitivity (50 mV/Pa) microphone measures over 136 dB or above 20 kHz. This microphone is a cost effective alternative to a ¼" microphone and preamplifier combination and has a much lower inherent noise. Common applications for this high amplitude, high frequency microphone include environmental monitoring, railway testing for horns above 140dB and sonic boom measurements. Key benefits of the 377A06 include the ability to measure to 40 kHz (+/- 3 dB), a 3% distortion rating to 160 dB, and a cost effective ½" package that maintains a 21 dBA noise floor. Model 377A06 is a stock item and available for immediate shipment. For additional information please visit www.pcb.com/acoustics or contact Mark Valentino, Product Manager, at (866) 816-8892 or email at mvalentino@pcb.com .